Bangkok (Thailand) – November 21, 2018 (travelindex) – After recently launching its two new boutique brands, Best Western Hotels and Resorts today announced its first Aiden Hotel and Sadie Hotel locations. The first-ever Aiden Hotel opened last month in Seoul, South Korea, and the next is set to open in December near Paris, France. The first three Sadie Hotel properties are coming to Tampa, Florida; Fredericksburg, Texas; and New York, New York in 2020. Sadie Hotel and Aiden Hotel are designed to creatively use space and technology by giving guests a unique experience. Each hotel will feature local flair with a thoughtful design, addressing the demands of today’s travelers. Sadie Hotel and Aiden Hotel will fill a void in the upscale hotel segment by giving developers the chance to be creative and incorporate local flair into their designs, retrofitting or rebranding an existing hotel with a modern, spirited aesthetic. The first-ever Aiden Hotel opened this month in Gangnam-gu, Seoul, South Korea. The 151-unit boutique hotel, pictured on the right, offers travelers not just a place to stay but a fun and adventurous experience. With modern signature seating, a multi-functional public area, convenient mobile check-in, and locally inspired designs, the hotel has a fresh and innovative approach that truly stands out from the competition. The second Aiden Hotel is set to open in mid-November of this year just north of Paris, France. The 90-room boutique hotel will offer a variety of amenities for guests to enjoy, including a multi-functional space, bar, restaurant, pool, and three meeting rooms for business travelers. Guestrooms will feature local designs with chic and sophisticated décor. Aiden Hotel’s sister brand, Sadie Hotel, will be introduced soon as well, making her debut in New York, New York, Fredericksburg, Texas and Tampa, Florida. The 70-room Sadie hotel in Tampa is slated to open in the spring of 2020. The New York City location will follow shortly after with a stylish and edgy design to fit seamlessly into the heart of the Big Apple. The Fredericksburg, Texas property is located in Texas Hill Country which is home to over 45 wineries and vineyards. 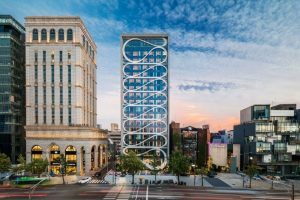 All three of these hotels will compete in the upscale segments and offer innovative amenities linking state-of-the-art technology with colorful, local flair.